South Florida State College is accredited by the Southern Association of Colleges and Schools. To provide options for upper division degrees, SFSC has partnered with several public and private colleges and universities to provide degree programs close to home. Our partnership degree programs offer the same high-quality degrees that are provided on the home campuses. However, at the SFSC University Center your classes will be smaller, so you will receive more personal attention and may experience more social interaction with your peers. Classes are offered primarily at the Highlands Campus. Some programs offer classes through distance education, including Web-based and online options. Because the SFSC University Center programs are designed as 2+2 partnerships, students are expected to have completed an associate in arts degree (A.A.) or associate in science degree (A.S.) or have earned 60 credit hours of college-level classes before applying to the upper division institution. Students who have completed bachelor’s degrees must still meet the university admission requirement of the institution being considered. Students who do not have an A.A. or A.S. degree may request individual evaluations to determine their eligibility. The IDS programs provide students with the skills to integrate academic disciplines through various levels of analysis and synthesis of information. The programs promote examination of complex issues in our diverse contemporary society through the assimilation, evaluation and utilization of multiple areas of study. The IDS program provides students the opportunity to obtain a degree by combining previous college studies with courses that will prepare you for today’s challenging work environment. The IDS program will provide you with skills to integrate academic disciplines – all in an accelerated format. The Department of Computer Science offers a Bachelor of Science in computer and information science, with majors in software engineering and computer science. The software engineering major is specifically designed for the student preparing for a career as a software professional, while the computer science major leans more toward preparation for graduate work in computer science. The Interdisciplinary Social Science (ISS) program offers students a liberal arts education that helps them become informed citizens who understand and can resolve the myriad issues emerging at every level of society. Rather than focusing on a particular content area, an ISS program emphasizes applying critical thinking skills and cultural and international literacy to several disciplines. The Warrington College of Business plans to offer an online undergraduate degree program designed to allow students to complete a Bachelor of Science in Business Administration (BSBA) with a major in general business. The BSBA program consists of 15 upper-division courses, each of which is four credit hours. The curriculum is designed to fit seamlessly with an associate in arts degree. The RN to BSN program is designed to capitalize on the prior learning and experience of the registered nurse. The program consists of 30 to 33 credit hours of nursing courses. After a student successfully completes the first 16 semester hours of course work, validated credit for up to 30 credit hours in nursing may be granted. You must be a registered nurse licensed in the state of Florida to enter the program. The Master of Arts in reading education K-12 is designed to prepare special reading teachers, clinicians, supervisors, directors, and coordinators of reading for school systems. The Completion Program at Webber offers options to the working adult seeking a degree in Business. The Bachelor of Science in Business Administration is a program that recognizes the ever-changing needs in the world today. The program offers flexibility for students who have career goals that require a business background. Areas of concentration include accounting, management, marketing, and general business studies. Contact the SFSC University Center to obtain information on the various programs or the program of your choice. After you have reviewed the information and would like to meet with someone to pursue admissions, etc., call, e-mail or stop by the SFSC University Center. We will direct you to an advisor from one of our partnering schools. The advisor will be able to answer your questions about their programs, prerequisites, admissions standards, transcripts, and tuition. Apply to the school of your choice (from the list below). You are eligible to become a SFSC University Center student after you have completed your A.A. or A.S. degree or have completed the equivalency of your freshman and sophomore year of college. Applications may be completed online (click appropriate link from within selected school list below), or pick up a hard copy application form at the SFSC University Center. You must meet the admission requirements of the partner school, which becomes your home campus while you are attending classes at the SFSC University Center. The courses for your degree program will be taught at the SFSC University Center at the Highlands Campus, or may be offered through distance learning via the Web or two-way interactive TV. Students interested in receiving grants, loans, or other financial aid must complete the FAFSA. Contact the Office of Financial Aid through the home campus. Phone numbers and Web sites are listed below. Each partner institution has its own specific registration process. The SFSC University Center will direct you to the program advisor who will assist you with registering for classes and paying your fees. The tuition and fees to attend the partnership institution is the same as the cost of attending the home campus in most instances. Some colleges or universities may offer a tuition discount. Check with the program advisor to find out. Classes are offered primarily in the evenings, which cater to students who have commitments during the day. However, some programs that meet as a cohort group may require some day time and/or weekend attendance. Your program advisor will explain these requirements before you enter the program. 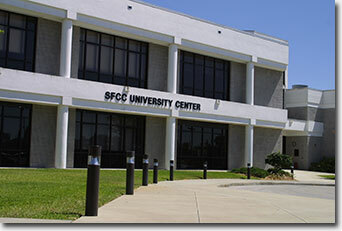 Most SFSC University Center classes meet on the Highlands Campus, located at 600 West College Drive, Avon Park, Fla. Note: The Organizational Management Program meets at the Hardee Campus in Bowling Green, Fla., on U.S. Highway 17 North.